How to get there: The natural trailhead is Campo Imperatore, elevation 2135 meter, GPS location: North 42:26.557, East 013:33.528. This is the top of a gondola lift that starts at elevation 1125m, north east of the small village Assergi. Assergi is about 117 km from Rome along autostrada 24. 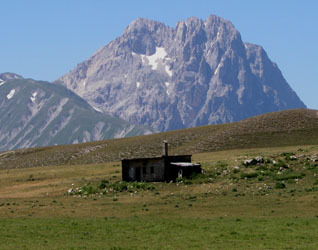 In summer, you drive about 20 km from Assergi to Campo Imperatore. 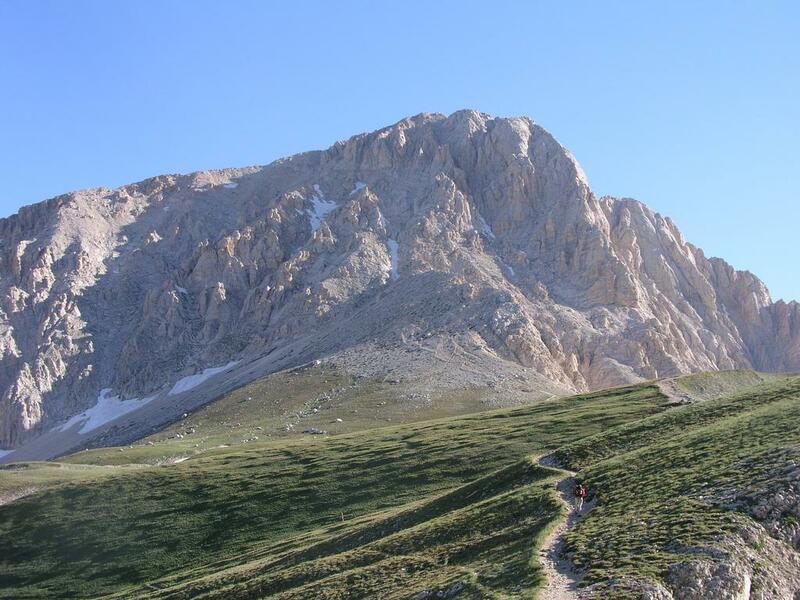 The lagest city on the east cost is Pescara, smaller roads from there lead east to the village of Farindola and then an additional 43 km to Campo Imperatore. 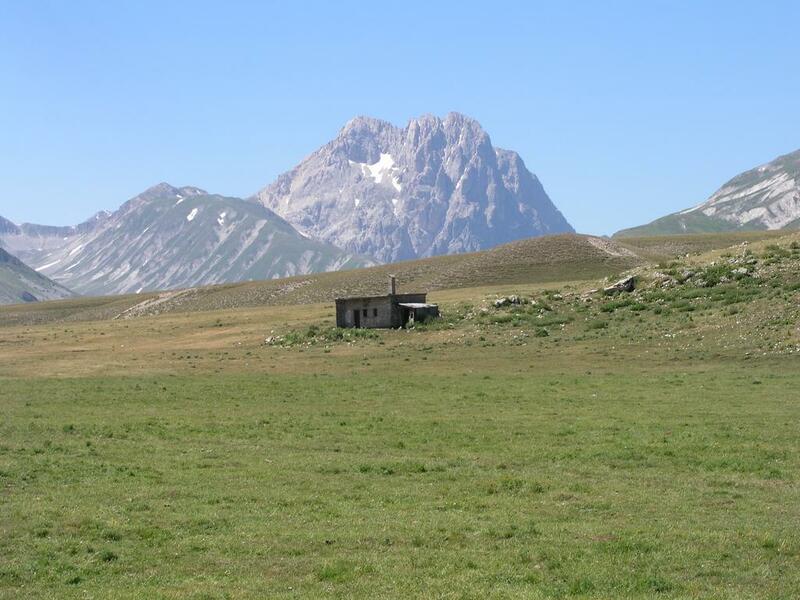 Albergo Campo Imperatore is also known as the place Mussolino was kept prisoner from August to September 1943. You can sleep and eat here, Euro 50 per person for dinner, the room and breakfast in July 2004. Via Direttissima, direct up the south face: From Campo Imperatore, hike straight uphill on the left side of a building that looks like a small observatory. 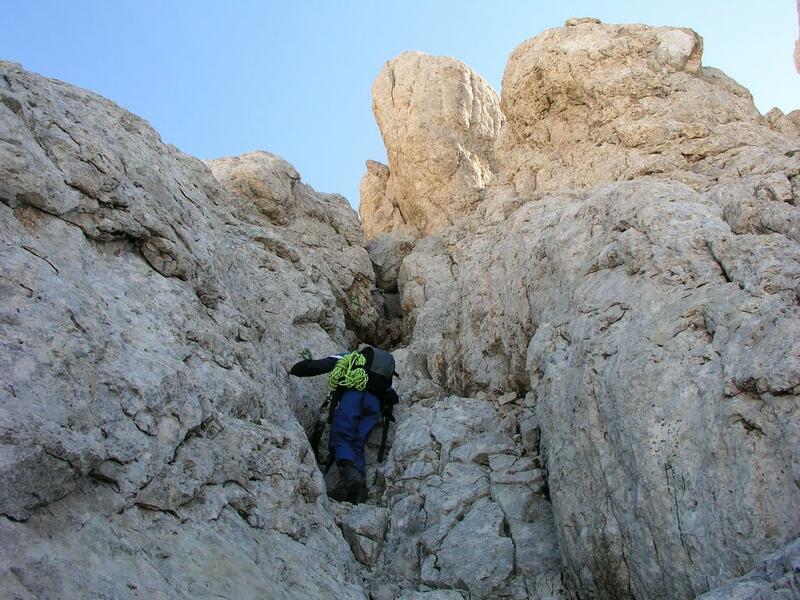 The trail climbs about 75 vertical meter to a point where it forks. Turn right and continue flat on a good trail across the fairly steep hillside. (The other trail continues up this hill to the hut rifugio Duca degli Abruzzi, 2388 m.) The trail then zig-zags up to the saddle Sella de Monte Aquila, elevation 2335 m. Turning right at this ridge, the south face of Corno Grande is right in front of you. 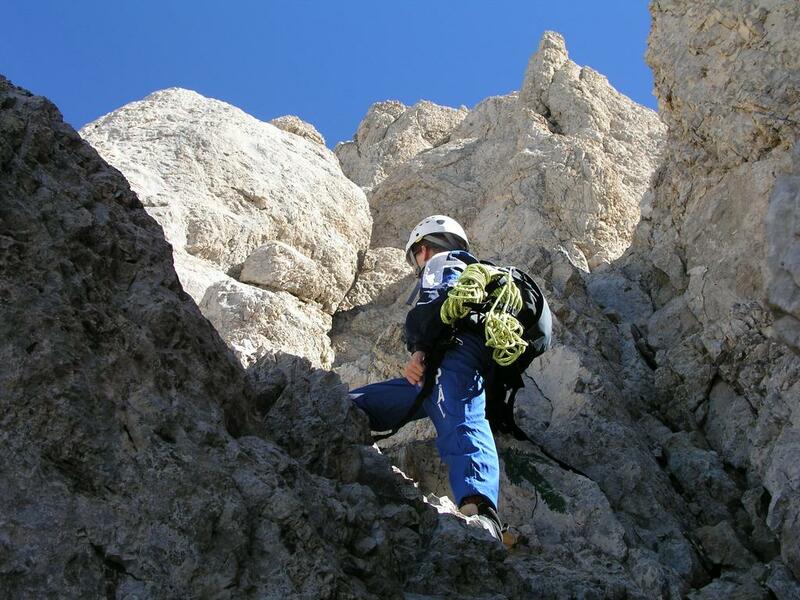 Soon thereafter, the trail forks again, stay right and head towards the lower slopes of the Corno Grande. There is yet another trail going right a bit further on, ignore it and focus on your goal. The first slope is full of loose gravel, there are a number of zig-zag trails, pick the one that looks best to you and climb this initial slope. You will arrive at a small saddle where the trail forks again, the right fork heads towards an intimidating cliff, while your trail continues straight up. There is a sign here, see the picture below. You are now at about 2600 meter, the introduction is over, what remains is 300 meter vertical gain, almost all (YDS) class 3, mixed with harder class 4 terrain. The route is partially marked with triangles painted on the rock, however, this is not consistent for route finding. Different from a possibly earlier route, described to follow the deep, pronounced gully in the south face, this route follows the broken ridge that comes down the south face. In doing so, there are several narrow, smaller gullies or cracks that are followed upwards when natural. After an initial section of easy scrambling staying right of a deep gully, a steeper section ahead must be climbed. One way to do this is up a crack, then an exposed move across to the first narrow crack and up this one. A possibly better alternative is to move slightly right and ascend up through a small notch (there is an old piton here), then move left and join the route above its first crack. Higher up you enter a second crack that ends with a large boulder blocking its top exit. Either climb steeply up on the left side of this boulder (tricky move), or exit the crack right and climb up an alternative route to gain easier terrain. Next, head upwards towards a hole under a large rock, the route does not go through this, but exits left and gains higher ground before again going right up a gully to a saddle separating this from the deep gully on the right side of you. Move left across exposed rock and gain a small notch higher up. Either continue up a small ridge above you or move into a final crack on your right and follow this up to where these alternative paths again merge. 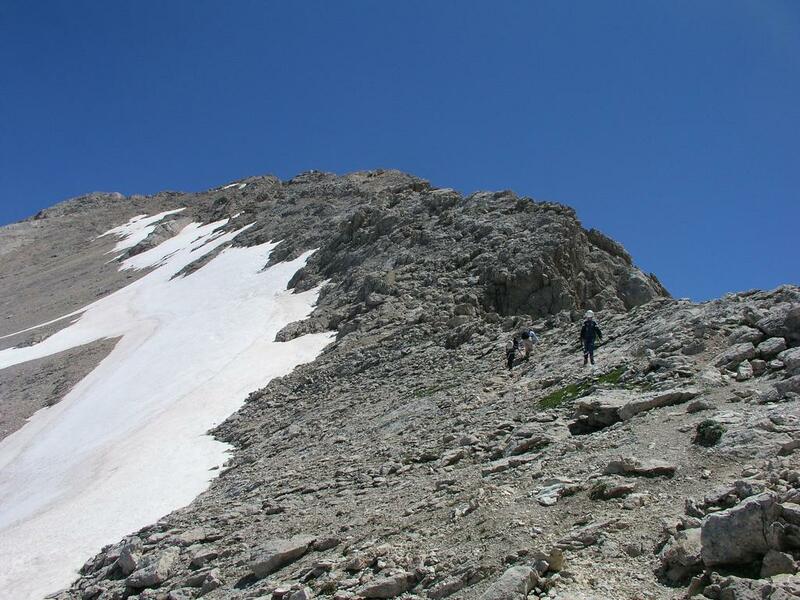 What remains now is easier scrambling directly up towards the summit marked with an easily recognized cross. When we did this route, there was a mix of unroped and roped teams doing the route, each team should proceed according to their own skills and experience. Descend via the west ridge (normal) route, see below. Via Normale, ascending the west ridge: Follow the description above (Via Direttissima) from Campo Impertore until the 2335 meter saddle Sella de Monte Aquila. Take the left fork in the trail and contour north for about one kilometer. Ignore trails that go (downhill) to your left, continue at a more or less level elevation towards what looks like a very steep slope in front of you. The trail climbs this slope while traversing left, the trail is good and the slope less steep than anticipated, you reach a plateau called Sella del Brecciaio at 2506 meter. Another trail fork, stay right and continue the ascent until you reach Conca degli Invalidi at 2615 m, where the trail forks again. The west ridge route to the highest point of Corno Grande forks right at this point. The trail more or less follows the ridge, it is well marked, very visible and never very steep. The difficulty of this route stays at (YDS) class 2+ for extended periods of time. However, it never gets any harder, there are short cables that hikers can hold onto for extra security in two places. There is some exposure and one should hike up and (especially) down with attention to the rocks and possible loose gravel. Comments: I did this climb with my son Pål Jørgen, age 15. 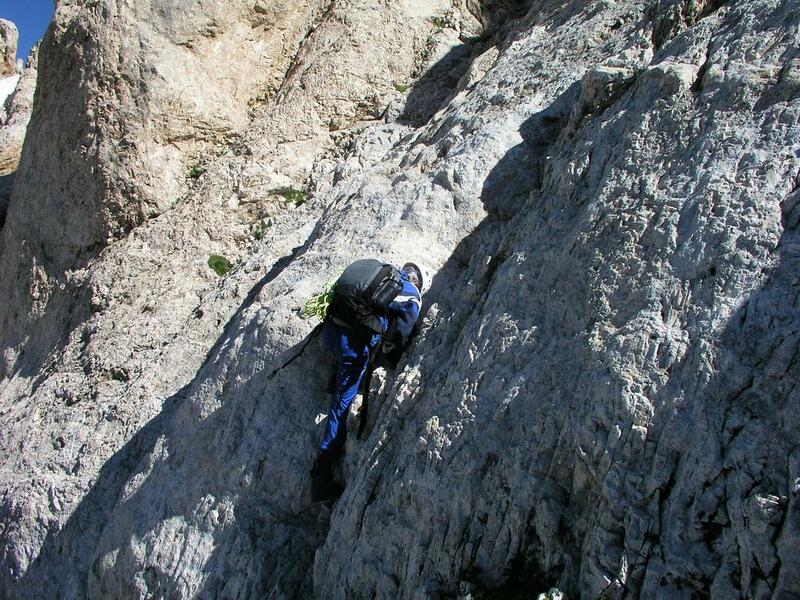 We took the direct route "Via Direttissima" up and descended via the normal route on the west ridge. 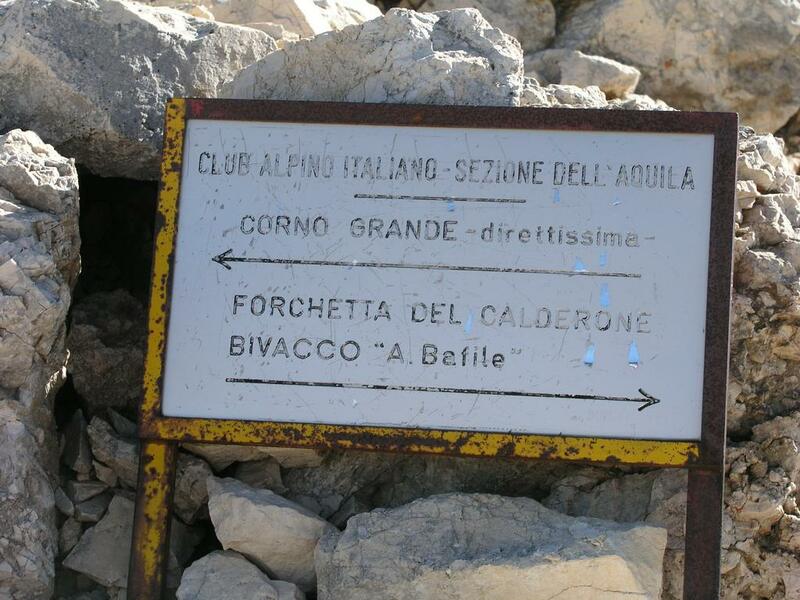 We started from Albergo di Campo Imperatore at 0800, arrived at the base of the mountain at 0900, and at the summit at 1100. We spent 30 minutes there in absolutely gorgeous weather. This being a nice Saturday in July, there were about 50 people on the summit. Most having arrived via the Normal route ascending the west ridge. A couple of teams arrived directly up "Via Direttissima" (the direct route up the south face) roped up, several more arrived the same way solo climbing. We took a very leisurely return with numerous stops down the "Routa Normale" and returned to Campo Imperatore at 1400. 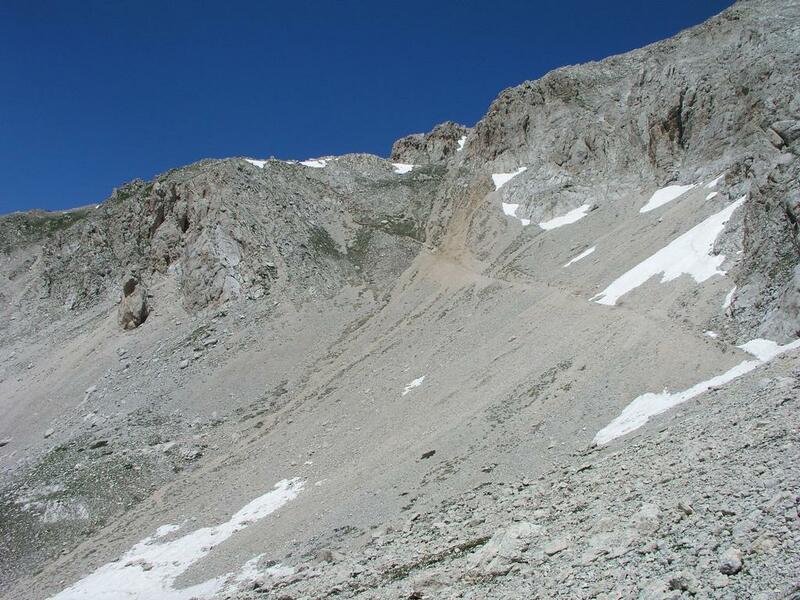 The southermost glacier in Europe struggled in the warm weather on the north side of the Corno Grande mountains. The Corno Grande has three summit peaks (west, central, east) appropriately called Vetta Occidentale (2912m), Vetta Centrale (2893m) and Vetta Orientale (2903m). North of Corno Grande lies Corno Piccolo, (2655m, primary factor 108m). 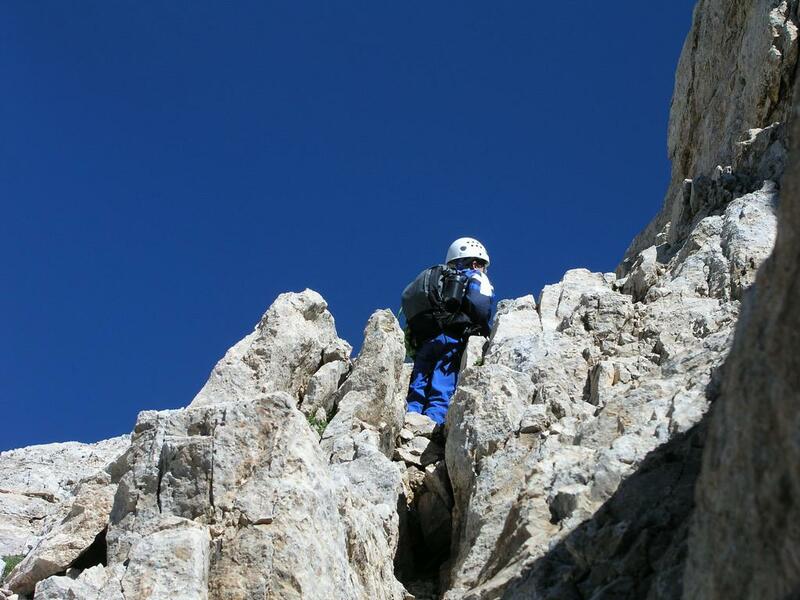 Vetta Occidentale has the largest primary factor of any Italian mountain and it proudly holds the 5th. position on the European continent. Our Italian vacation continued the next day with Monte Camicia. Corno Grande, West (2912m), Middle (2893m) and East (2903m) summits. Sella de Monte Aquila ,panorama view from west to north. 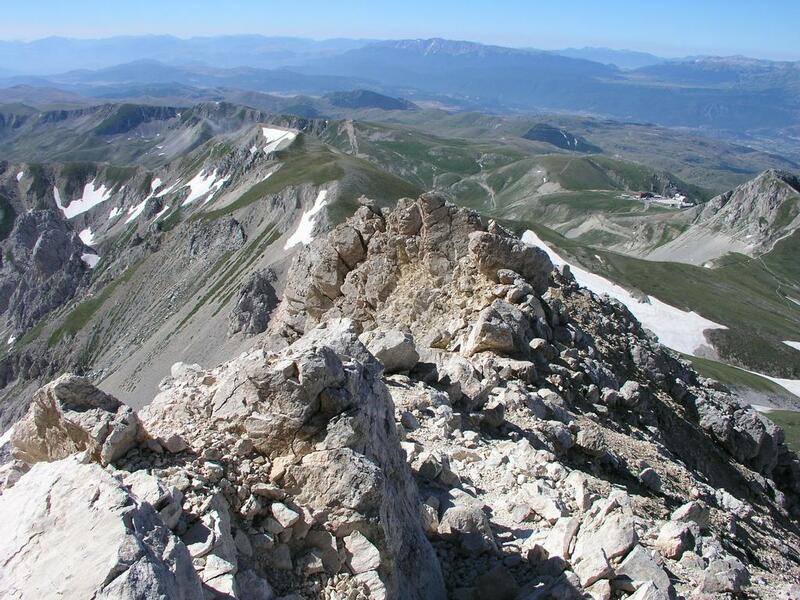 The three most significant summits are Pizzo Cefalone (2533m), Monte Corvo (2623m), and Pizzo d'Intermesoli (2635m), Corno Grande rises in the right end of the picture. Corno Grande south face. The direct route follows the broken ridge that connects directly with the trail access. This is just left of the deep gully where some snow can be seen at the lower end. Via Direttissima starts here, another climbing route forks right. A look back from the beginning of the route to the trailhead. Class 4 terrain ahead. One way is up this crack then across left to the gully. We ended up finding an alternative a bit further right. Advancing up a narrow gully. The next problem is the big blocking boulder that can be seen higher up. A class 4 move, Pål Jørgen finds a way around the boulder on the right side. Exploring the route, fun climbing, what is next? 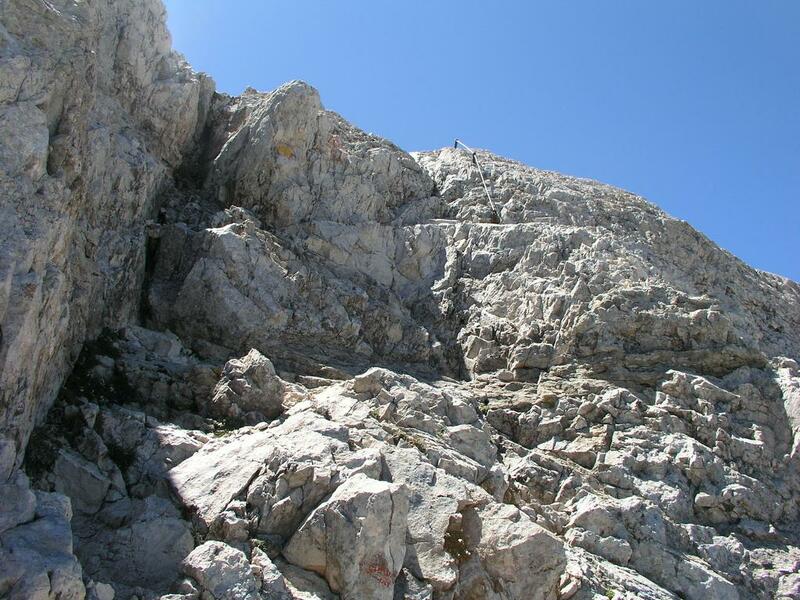 We are not up yet, the climbing part of the route is about 300 vertical meter. 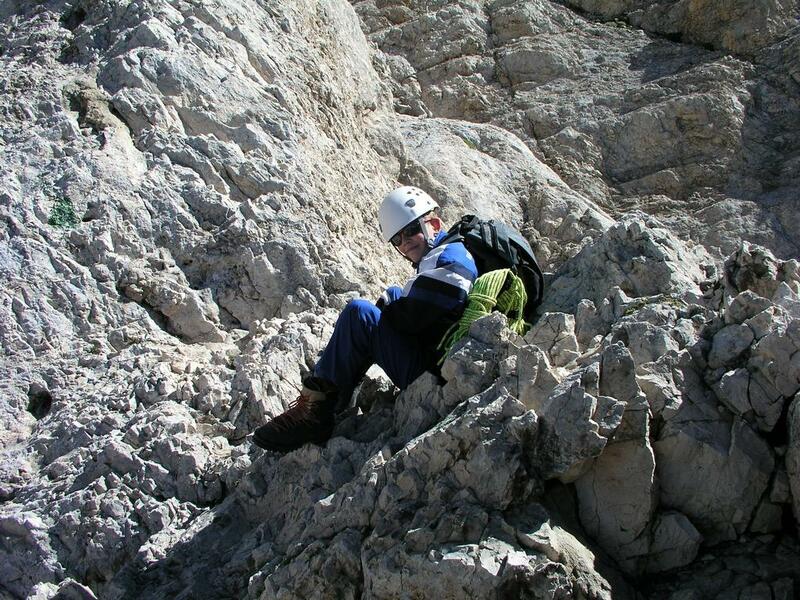 Before the last class 4 section, Pål Jørgen is sitting in a saddle between two steep gullies. The route continues up left, into a small notch, then more up on the ridge and finally into a small gully/crack. There is some exposure here. 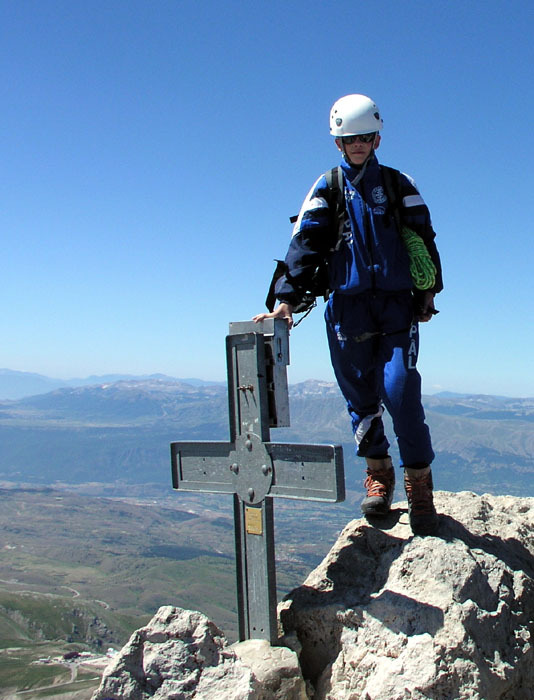 The summit cross, Pål Jørgen on top of Corno Grande. The approach to the west ridge, less steep than it looks. The west ridge, the standard route climbs this ridge. A little help on the standard route. The crack to the left is perhaps equally easy.